If you’re constantly in search of delicious meals to cook for yourself or your family and you don’t know who The Pioneer Woman is, you’ve been missing out. Ree Drummond lives on a ranch in Oklahoma with her husband and four kids, and she has turned her experiences as a cowgirl into a hit blog, showcasing photography, recipes and more from the ranch. 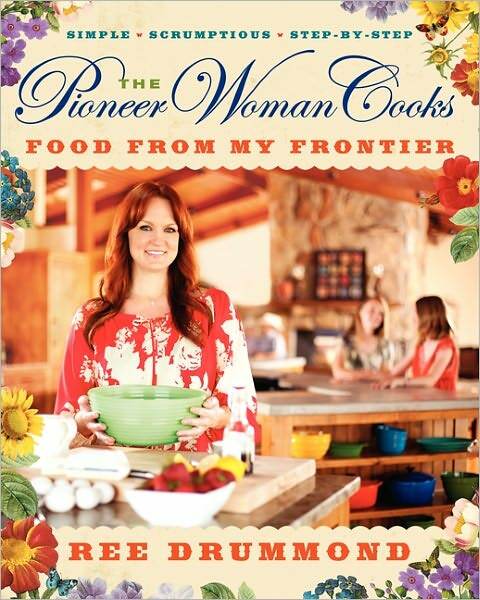 With The Pioneer Woman Cooks: Food From My Frontier, Ree brings us her second cookbook full of mouthwatering dishes. Ree Drummond is a wife, mother, cowgirl, cook, homeschool teacher, amateur photographer, blogger… the list doesn’t end! She also is the host of the show The Pioneer Woman on The Food Network, where she invites viewers into her home on the ranch and demonstrates delicious and simple recipes. We’re left wondering how she manages to do it all and still have time to author three books: one memoir and two cookbooks. Her latest cookbook The Pioneer Woman Cooks: Food From My Frontier tweaks signature dishes from her blog and show, as well as adding new, original recipes to delight any aspiring cook. Ree Drummond’s latest cookbook is perfect for new and seasoned cooks alike. Each recipe is accompanied by her beautiful photography, showcasing recipes step-by-step. Not sure what onions should look like once they’re sautéed? No problem, Ree has a picture for that. If you’re more experienced in the kitchen, The Pioneer Woman‘s recipes will be simple and easy solutions for any situation, from a busy weeknight meal to an elaborate dinner party. The real treat with Ree’s recipes is their breadth. Her specialty isn’t a type of food, or low-fat dishes, or, conversely, decadence. She has recipes in every type of food, from stir-fry to tacos — some are healthy, while others are soaked in butter. She has some of everything, but her main goal is to deliver sheer deliciousness. It’s clear that Ree is a fan of food, and she wants it to taste good for herself, and for you. So take your time browsing through these recipes. Her cookbook is beautifully photographed and organized with vibrant colors and personal stories from the ranch. There are over 100 recipes in this cookbook, so you’re likely to find something that appeals to you, no matter how picky your palate. She offers recipes for breakfast, lunch and dinner, as well as discussing sides, pizzas and pastas, and more. If you haven’t made something of Ree’s yet, take a chance on her. No telling what kind of meal you’ll make, but you can rest assured that it will have one very important characteristic — absolute deliciousness.